For my stay in Singapore I stayed in the 5Footway.Inn which is incredibly cheap for its location in Boat Quay, Singapore. There are over 500 hotels in Singapore, it’s a lot more expensive than Malaysia. Singapore’s most famous landmark is the Merlion (above). There is a walkway that goes out over the water and you’ll see lots of tourists making photos pretending that the water of the Merlion is landing in their mouths. From Merlion Park, if you are there at sunset, you get a wonderful reflection of the sunset on Marina Bay Sands. You can also visit the skypark on the top level of Marina Bay Sands for sunset or a view of the city. Behind Marina Bay Sands you’ll find the Gardens by the Bay, these are the most Instagrammable gardens you’ll probably see in your life and are well worth a visit. Another notable landmark close to marina Bay Sands is the Singapore Flyer (above left). This is Singapore’s version of the famous London Eye. Singapore Theater is designed to look like a huge Durian fruit with it’s spiky roof and color. The building real stands out as a unique building even with Singapore’s skyline. If you don’t want to watch a performance but want to see the interior it’s possible to take a guided tour of the Theater. Singapore Theater is one of the many modern buildings of Singapore. There are a few older buildings around the city too, a notable one is the Telok Ayer Market (Lau Pa Sat) which is Victorian style building dating back to the 19th century. Nowadays it’s a food market, foodies will love it. 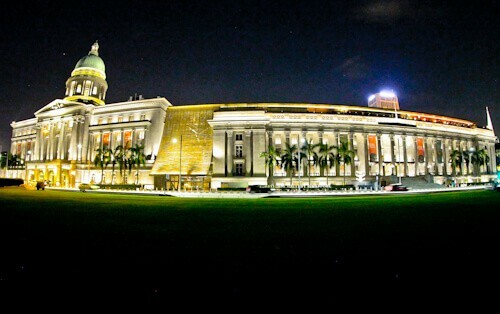 Whilst exploring the Downtown Core of Singapore you’ll see countless stunning buildings. The Supreme Court of Singapore is no exception, when I took this shot I was completely surrounded by Instagrammable buildings. The best time to walk around Singapore photographing buildings and landmarks is at nighttime, during the day it can be too hot and everywhere is well lit at nighttime. 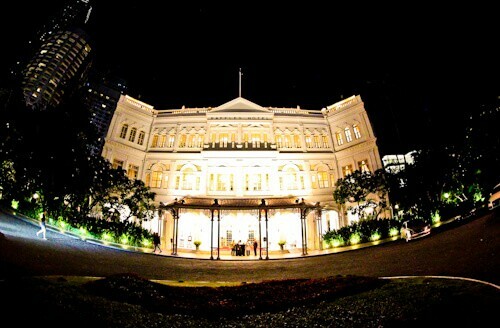 You can buy a famous Singapore Sling in Raffles Hotel which will set you back over $20 per glass. Still, it’s worth it for the experience, this is where the Singapore Sling was invented at the start of the 20th century. More economic places to eat and drink are the bars and restaurants of Clarke Quay and Boat Quay. The views of the city and over the quays are beautiful whilst enjoying a meal / drink. 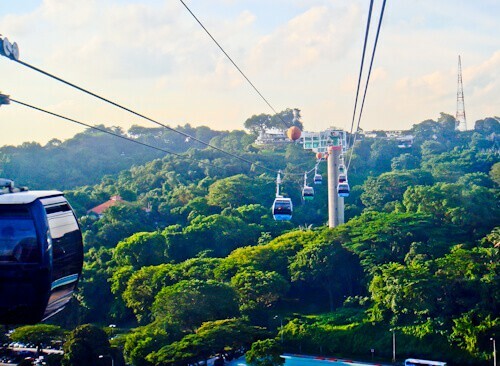 A wonderful way to get to Sentosa Island is by the cable car sky network. When you buy your tickets you can choose from several packages, the packages include round trip on the cable car as well as entrance to some attractions on Sentosa Island, you can choose from around 20 different attractions on the Island. 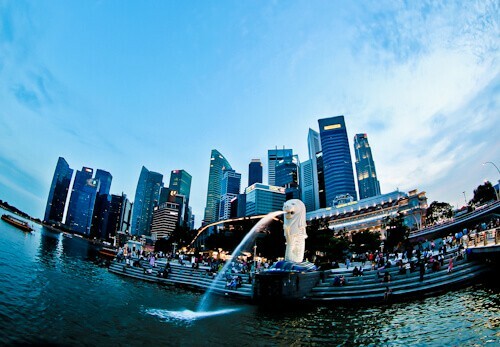 The most famous landmark in Singapore is the Merlion in Merlion Park on the main Island. The second most popular Merlion is on Sentosa Island which at 37 meters in height is a lot bigger. It’s possible to ascend this Merlion to its mouth and top of its head where you get beautiful views of the city and Sentosa, potentially a unique place to watch the sun set over Singapore. Universal Studios Singapore is close to the Merlion, I have been in Orlando and Los Angeles so I didn’t visit the one in Sentosa. If you are traveling with kids (or even on a date) I’d recommend Universal Studios, Sentosa. 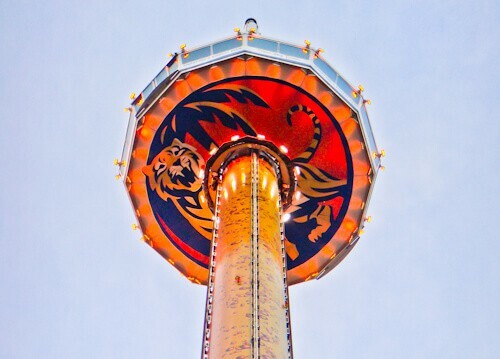 The Tiger Sky Tower is the highest observation tower in Singapore. Tiger beer is the most popular beer in Singapore and after trying several I would definitely recommend Tiger beer. Good places to enjoy beer in Singapore are Boat Quay and Clarke Quay which are full of bars and restaurants, as beer in Singapore can be expensive look out for happy hour. There is a free monorail on Sentosa Island but the whole Island is small and walkable, there’s air conditioning in the monorail so if you’re hot you can use this to cool down a little. The huge casino, Resorts World, is another good place to go to escape the heat. 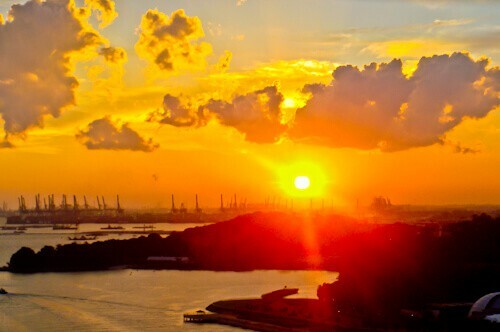 I experienced a Singapore sunset on the cable car returning to Singapore from Sentosa. When you arrive in Indonesia you’ll need to pay for a visa on arrival. The difference between Singapore and Indonesia is huge, remember you are leaving Singapore, one of the cleanest, well organized countries in the world and arriving in Indonesia, a 3rd world country with a huge population. You can buy tickets for Belawan (Medan) in Batam from the Pelni office, I’d recommend traveling first class unless you are on a super tight budget, basic meals of rice and chicken are included in the price. You will see cockroaches on the boat in all classes, so be prepared. When you arrive in Belawan, you must then take a shuttle to Medan, there will be crowds of taxi and shuttle drivers waiting for the arrival of the boat, negotiate a price before leaving with any of these. The price for a shuttle should be less than 20k Rupiahs per person, a taxi will cost 5 times the price but still represents good value. Get ready for chaos when leaving Singapore for Indonesia! I’ve been to Singapore 2 times, and honestly for me, it’ll always be a stopover destination! I totally agree about the Gardens by the Bay, very instagrammable, and it was one of my most popular posts. I also had 2 nights in Jakarta…now that was an experience! Singapore is a place I’ve been trying to get to for two years! Every time we start planning, a deal comes up for somewhere else so we end up going there. I agree with the above commenter, seems like a great place for a long layover. The cable cars look really cool, we have something similar near me and it’s a great place to see the sights. I’ve never been to Singapore before, but I’m planning to go next year probably. For the past months I’ve been reading so many interesting things about it. And… I mean, just by looking at your pictures! It looks so cool! I have never been to Singapore as I thought it is a business city. But your post tempts me to go there as it has many touristic attractions. Lovely view of sunsets! 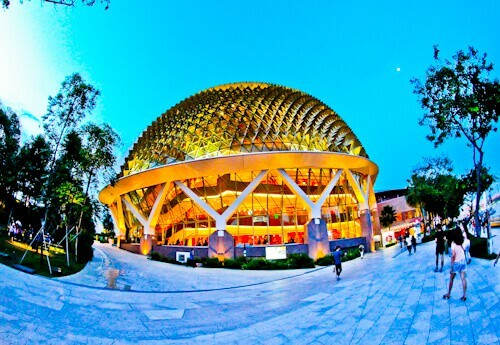 I liked the Singapore theatre – Esplanade and its story how it is constructed like a fruit shape with spikes. Nice photogenic place. I will land in Singapore on December 13th and this got me soooo excited!! I cannot wait. I will be checking out EVERYWHERE on your list when I go! I would love to visit Singapore – even more now that I’ve seen your gorgeous photos. The architecture looks amazing. My son was in Singapore a few years ago, and I’m going to share this with him. I bet it will bring back lots of great memories. I visited Singapore when I was 6. I remember nothing except how clean everything was haha. It must have been such a difference going from Singapore to Indonesia! Regardless, both are stunning countries and it really seems that you enjoyed your time in Singapore! I do hope to visit Southeast Asia again soon! I have been to Singapore two times. I have been to many places of attraction there. But after seeing your list I think that there many which I could not cover. The main thing I did not cover is to spot the 5 Merlions, I only saw 2! Very detailed post on the points of interest of Singapore, loved it. 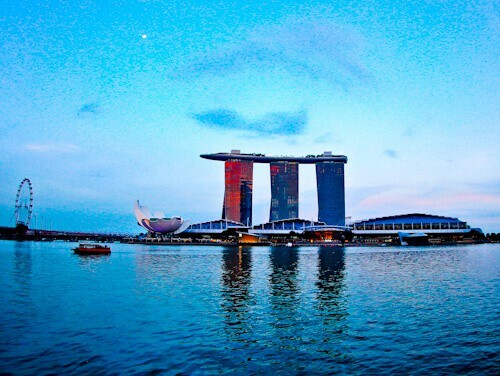 Wow these Singapore pictures are amazing, especially Marina Bay Sands at sunset. I’m planning Singapore soon and I will look forward to go here, as a foodie I must check out Telok Ayer Market. Glad to spot your blog and get this idea! Singapore looks lovely! I’d be right there checking out the Merlion. The cable car looks fun and scenic, too. I’ll put Singapore on my list, for sure! This article got me buzzing!! I fly there in only a few short months ( which has felt like an eternity) but cannot wait to check out these awesome places! I think Marina Bay might be number one for me! I enjoyed visiting Singapore a lot, mostly because of the food. The Botanic Gardens was my favorite non-food related place, sorry you missed it. On my part, I have to try the cable car ride when I visit again. Safe travels in Indonesia! Wow you provide so much information about the points of interest of Singapore and it’s all here on the same page, I really appreciate that. Whenever I go to a new place I try to read about how others do it, not just Google Maps so I found this post very helpful thanks to all of your tips. Thank you! I have never heard of Telok Ayer Market, as a foodie this is where I must go! I’ve never visited Singapore, but it looks amazing. I would love to go see the Merlion. I bet the views from its head or from the mouth are incredible. I have never even heard of this attraction before nor the foodie market, Telok Ayer Market. This post is taking me back to Singapore, love that place! Love you post, especially the Tiger beer recommendation, agree! The Gardens by the Bay are so beautiful, especially the night show. We were in Singapore a couple of months ago and loved it! You’re right – Gardens By The Bay are the most instagrammable gardens ever! I absolutely loved them and could have visited over and over again. We didn’t get a chance to ride the cable car – will have to book it in for next time! My friends and relatives in Singapore have been inviting me so many times! Somehow I don’t gather enough interest to venture there! But I’m always astonished by how this tiny country can keep so many tourists so interested and leave them wanting for more! Yes, as you’ve mentioned, Singapore has grown to be one of the costliest countries in the world, more than European countries. Sentosa Island is a place that I’d like to see! I will be probably traveling to Singapore this year and I must tell you that your post is quite helpful. I Loved the Marina Bay Sands and the sunset photographs. It’s quite a great place to hang around and capture some amazing photographs. No photo of you pretending that the water of the Merlion is going into your mouth? 🙂 Singapore looks like a lovely place to visit. I would definitely want to get to the gardens, as I always want to get to gardens in a new place. I love how much outdoor stuff there is to see and do in Singapore. These are awesome places that you visited. I like the Esplanade the most because I like durian. Haha! The spikes look fascinating and modern. I would love to visit the Concert Hall and discover more about the architecture of the building. I love Singapore. Had been there at least 20 times. Love all the places you mentioned above but my favourite is Pulau Ubin. it’s like a different world altogether. I would love to visit Singapore one day. Your photos are incredible, especially the night ones. Takes some skill! I love the Tiger tower, very cool! I love the idea of Singapore but I haven’t quite made it there yet. I am always seeing pictures of the Gardens by the Bay and they look incredible. 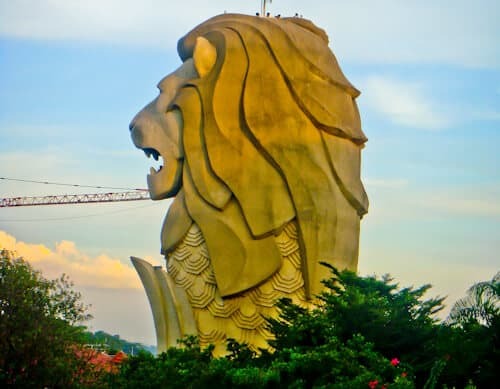 I hadn’t seen the merlions before – the one on Sentosa Island looks incredible, I bet the views from the top are great! Great photos too, especially the wide angle/fish eye ones! I haven’t been to Singapore in 20 years. Of this list, I’ve only been to Raffles Hotel. I would love to go to Marina Bay Sands and see all 5 Merlions. Maybe in the next year or two I’ll have the chance to visit Singapore again (and Sentosa). Great list of the points of interest of Singapore! I’ve been to two of them and I agree that it is a totally different city between Singapore and Medan. Bad traffic and the cleanliness probably are two most concerns in Medan, the complete opposite to Singapore. You have shown a side to Singapore I have yet to see. I have never been, but from your extensive list of attractions it seems quite interesting to visit. Sentosa island would be a place a like to see. I would love to see the views from the Merlion on Santosa island. Thanks for sharing. Singapore is definitely on my bucket list and am planning to visit it soon hopefully. Sentosa definitely sounds interesting with all the activities to choose from over there and the free monorail. I’d love to see all 5 Merlions! I actually had a chance to pursue a master’s thesis opportunity and research position in Singapore recently, and I declined, but not because Singapore didn’t have enough to offer! Singapore is beautiful and full of unique culture, and so close to many great destinations as well. I didn’t know there was a cable car over to Sentosa, that view is gorgeous! Can’t wait to hear more about your adventures. Singapore is a small but orderly city, if you know your way around – like what this blog is post is showing, you can easily discover a lot of fascinating places and fooood. We will be in Singapore in a few weeks after travelling from Bangkok overland. We love Singapore so looking forward to a bit of calm after the hecticness of the weeks before. Also last time Gardens by the bay wasn’t there so can’t wait!! And sentosa on our agenda this time! I really liked this post because of how clean Singapore looks in your pictures. I knew the most famous landmark of Singapore was the Merlion but I didn’t know there were 5 Merlions. I’ll have to find all 5 Merlions when I finally make an adventure to Singapore one day. My favourite part of Singapore is Clarke Quay: I love weekend evenings there! I am so happy that Indians can also get a visa on arrival in Indonesia! Usually, it’s the visa issues that make travel such a pain. I would love to travel more by train as compared to flights! Great pics, James. Never been there before but intend on going one day. Cheers for all the info. Well done! Singapore is great fun and I have already been four times and have plenty more reasons to go as I have never even been to Sentosa Island. Great tips for things to see and do! We have loved our visits to Singapore, enjoyed reading this post as it bought back lots of lovely memories, thank you! I’ll be grabbing that cable car to Sentosa next time I’m in Singapore, the views are fab! 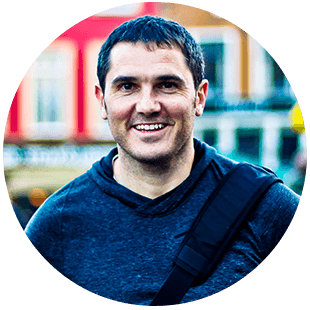 Great stuff James – I’ve visited Singapore a fair few times now and I think it’s a great city. Sure it’s a bit expensive compared to its neighbours but there’s still a lot of fun to be had. Took the ferry to Batam back in 05, but didn’t quite go as far as you! The Singapore Theater does look like a durian fruit, that’s so awesome! I hope to visit and explore Singapore one day 🙂 Added to the list! Where was this post when I was in Singapore a couple of weeks ago?! Jeez, there is some good information in here, pinned for when I return again in a few months time and thank you for sharing! I’ve never been to Singapore, but we’re hoping to get a layover there when we finally visit Joe’s family in the Philippines. I love all of your pictures. As always, the photos are absolutely beautiful! Singapore is such a beautiful city! Did not realise there are 5 merlions! We would love to revisit. The last time we visited was years ago. Singapore is truly one of the best places in the world. All of these attractions are on my bookmark now. 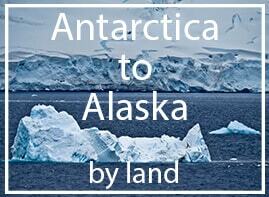 I am going there in a few months time and I couldn’t be more excited!